Properties in Czechia average 4.3 out of 5 stars. Property 5: Sunny apartment near the center. Property 8: Unique Havelska Market HideAway, Peace, Tranquility in Heart of Old Town. Property 18: Friday Songs' Luxurious 1 bedroom Apartment by Charles bridge and Prague Castle. Property 20: New reconstructed building Wenzigova at walking from public transport and famous area ! Property 22: New reconstructed building Wenzigova at walking from public transport and famous area ! Wenceslas Attic I apartment in Nove Mesto with WiFi, integrated air conditioning & lift. 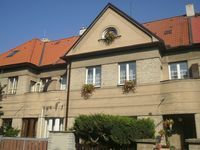 Property 33: Wenceslas Attic I apartment in Nove Mesto with WiFi, integrated air conditioning & lift. Property 47: In Centre Prague Large Flat Design/Old town in 10 minutes,tactical area,8 BEDS! The location of this apartment is perfect. Easily walkable to all sites and tucked away enough for quiet evenings. My husband and I enjoyed having a nice kitchen, bathroom and sitting room. The views from the apartment are beautiful and we definitely enjoyed our time in the apartment as much as we did outside of it. Everything we needed was taken care of and we loved the restaurant recommendations that Ilan gave us. All in all a perfect stay in an incredible city. Thank you for everything!